The Nissan Murano is fully redesigned for the 2015 model year. But how does it compare to its major competitors? The Murano’s closest rival is the Ford Edge, but we’re taking this comparison a step further. 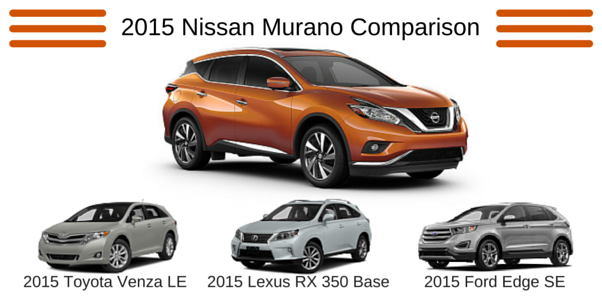 We’ll compare the 2015 Nissan Murano S to the 2015 Toyota Venza LE, 2015 Ford Edge SE, and 2015 Lexus RX 350 Base. If you do a simple Google search of 2015 Murano comparisons, one of the first results to surface will be a great comparison from The Car Connection. While they take many more models into account, such as the Hyundai Santa Fe Sport and Jeep Grand Cherokee, you’ll notice the Murano’s TCC Rating is on par with, or higher than, the other models. That’s already a good sign of how the new Murano compares. But let’s look at the details a little closer and see how the Murano compares with the Edge, Venza, and Lexus when it comes to cost, interior and exterior features, safety, size, and more. The 2015 Murano does come with a slightly higher MSRP than the Edge and Venza, but with similar destination charges. As you might expect, the Murano is significantly more affordable than the Lexus. However, the Murano’s city, highway, and combined fuel economy is better than all the other models. One other “Nissan advantage” the Murano has, which you will notice upon first glance, is the Murano’s bold, exterior body material of both composite and galvanized steel, whereas the other models are just steel. One concept of note in the 2015 Nissan Murano is the “social lounge” concept Nissan designers had in mind from the start. With an open, airy cabin and a host of available technologies, the 2015 Murano is Nissan’s “most social” model yet. The 2015 Murano has more horsepower and torque than the Venza, and more horsepower than the Edge. Like the Lexus, the Murano has a 3.5 liter V-6 engine. The Venza and Edge engines are smaller. Unlike the other models, the new Murano is the only model with a Xtronic CVT transmission. When it comes to size, the 2015 Murano offers more exterior length and exterior width than all the competitor models. The Murano offers greater interior cargo volume than the Edge and Venza. The Murano features best-in-class cargo volume with all seats up and best-in-class cubic feet interior volume. All of the models in this comparison offer similar safety features—that’s one area auto manufacturers don’t like to compromise as you can imagine! That being said, the 2015 Nissan Murano also offers a class-exclusive available Predictive Forward Collision Warning and class-exclusive available Around View Monitor with Moving Object Detection. Additionally, the Murano has a standard vehicle safety security system which is not available in the Edge and Venza comparison trims. If you’re in the market for an SUV-type car, we invite you to come check out the 2015 Nissan Murano. With its exquisite exterior styling and expertly outfitted interior, we think it’s a superb model for the price even at the base trim as we’ve detailed above. After all, there’s a reason Popular Science named the 2015 Murano a “Best of What’s New” award winner. We think you’ll agree! This entry was posted in Nissan News and tagged 2015 Nissan Murano, Murano comparison, Murano competition, Murano competitors, Murano review, new murano, SUV reviews by Tischer Acura Nissan. Bookmark the permalink.